Scene set, the Introduction ends with a rundown of the basics of the D20 mechanics starting with the abilities and the various ways in which you can generate them, depending on things like how powerful characters are to be and how much choice as opposed to the randomicity of rolling them you want players to have. Next, Chapter 1: Character Creation takes you through the process for this particular game. Most characters are human, although there are two other options, both the result of government meddling – the Ghûl (or living dead) and trans-genetic mutants, created as potential super soldiers. They also need to pick a Background, which reflects their upbringing and faction affiliation, and an Occupation. There’s plenty of information provided to help you decide, and to portray the character appropriately once made. Just reading through them, you begin to get a vivid picture of life in the Wastelands, the various tensions and certainties that people live with. Interestingly, however, Class is very much downplayed in importance and is used to determine the character’s approach to life and interaction rather than reflect his vocation. Hence the choice is between Aggressive (who concentrates on combat abilities and is likely to use them as a first resort) and Defensive (who develops his skills and prefers to use methods other than brawling when possible… although will still be capable of combat when needs must!). What are normally ‘class’ skills are in the main derived from a character’s Background and Occupation, although other Class-determined matters such as hit points and saves still depend on the class chosen. You may also choose up to two Traits which further refine the character’s outlook or other core parts of his nature, each gives a minor mechanical advantage (often balanced with a disadvantage) although they are mostly for flavor. The Occupation list follows, these reflect the character’s calling, his trade, and are mostly used to determine starting money, although more ‘class’ skills may also be added. They range from ‘civilized’ activities like academics, law enforcement and religious leaders through traders and athletes (combat sports predominate) to out-and-out criminals and raiders. After all, it’s often easier to steal what you want than to earn it through hard work! All characters also start with a Talent, adding more every fifth level. Some Advanced Classes and other options also confer bonus Talents. Such Talents can cover anything from a glib tongue or leadership potential to enhanced brawling capabilities or mechanical aptitudes. Unlike the core D20 Modern ruleset, anyone can take any Talent they please provided they meet the pre-requisites. However, as well as the all-new Talents presented here, the original D20 Modern ones, updated as necessary to reflect the needs of the post-apocalyptic world, are also given here. That done, discussion moves on to Reputation. Not only characters, but places and organizations have reputations and depending on what goes on both fame and infamy can accrue. Then, Chapter 2: Skills covers all the Skills that the character may have gained during creation, detailing what they cover and how they are used both mechanically and practically in game. There’s a lot of detail here so players will know what their characters are capable of, and GMs have all they need to administer skill use with ease. Craft skills have an additional difficulty: that of finding raw materials and components for whatever you are trying to make. To help with this, there are comprehensive rules for scavenging, while every item has an additional quality of ‘scarcity’ reflecting how likely it is that you will be able to find any! Chapter 3 then provides similar information for Feats. Between all these, you can customize your character so that he is capable of, well, just about whatever range of things you want. Explanations are clear and whatever you are trying to do, the way in which your action can be resolved is laid out… a few typos, mostly careless or a lack of proofreading, but none which render it impossible to understand. Character done, now to Chapter 4: Equipment to kit him out. The chapter starts off with rules for such as concealing what you are carrying and indeed, how much you can carry and the monetary system, such as it is, before launching into details of the gear you really ought to have before venturing forth into the Wastelands. Firearms are covered in considerable detail – and at least the authors know the difference between a ‘clip’ and a ‘magazine.’ Even gunbunnies should find plenty of choice here – and there’s a delightful cartoon of a fellow scratching his head at a wide assortment of longarms in a gun cabinet, which reflects those less familiar with the fine detail of what’s available. The descriptions are clear enough for non-gunbunnies to cope, though. Just in case you’re getting nervous, the next section covers armor – from a biker’s leather jacket right up to power armor or a full-blown space suit. Even better, this is followed by medical equipment and, if it all gets too much, a selection of, ahem, recreational chemicals. There’s also an assortment of general field and technical gear and a section on food and drink that’s, shall we say, somewhat uninspiring. Make sure someone in the party can cook if you want anything tasty. At least you can get drunk, there are even rules for determining when you’ve had enough. Next, transportation and services. Back to transportation, with a handful of motor vehicles and rules for vehicular chases and combats. Petrolheads may be disappointed at the meager selection of vehicles (especially by comparison to firearms) but this is made up for with a comprehensive set of driving maneuvers that they can perform. Appetite whetted by vehicular combat, Chapter 5: Combat and Tactics covers the full scope of rules covering brawling in every shape and form. The course of a combat is laid out clearly, with a surprise round if anyone is taken unawares followed by 6-second combat rounds in which each participant gets the chance to act, which continue until the matter is resolved. Actions are taken in initiative order, and each character has a range of options in what he is able to do. Like all such systems, the better all participants know the rules, know what options they have and what to roll to resolve their actions, the faster combat can take place in the course of the game and the more exciting it becomes as players can focus on what they are doing rather than on the mechanics. There’s a particularly useful chart that makes it easy to see which actions have the potential to provoke an attack of opportunity, and all the different things you can do are explained well. It’s worth reading this through even if you are already familiar with modern combat using the D20 ruleset, and if you are not, this is an excellent introduction. Combat dealt with, other means of getting damaged or killed – fires, drowning and so on – are also covered. Of particular note is the section on ionizing radiation, a considerable danger in a post-apocalyptic setting where the ‘apocalypse’ was a nuclear war. The dangers of addictive substance abuse are also well modeled. Next, Chapter 6: Advanced Classes presents some options for characters who survive all the dangers of the previous chapter for long enough. So those wishing to become bounty hunters, daredevils, desert rangers, dreadnaughts, explorers, field medics, field scientists, gunslingers, harvesters (nothing to do with agriculture, it’s a ghûl with a fungus problem! ), infiltrators, made men, martial artists, master traders, mutant beserkers, mutant commandos, prizefighters, riggers, slayers, snipers, socialites, soldiers, Steel Disciple initiates (think militia combined with cult – but actually they are the remnants of the US government! ), street warriors, swindlers, thrashers, tribal shamans, tribal warriors, or weaponmasters need look no further. As well as meeting various requirements in terms of skill and ability levels, many also have ‘story’ requirements, so players who wish their characters in these directions need to discuss the matter with the GM so that appropriate opportunities arise. The range of options are considerable, and each allows the character to develop in interesting and possibly unique ways. 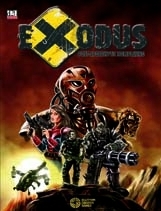 Finally, Chapter 7: The Exodus World presents an overview of the setting in which the characters find themselves. There’s a list of leading organizations, and just reading the descriptions of them spawns ideas for plotlines involving them. Next comes a map of the area involved, from the Californian coast across to about Roswell in the east, followed by descriptions of major settlements. While again full of ideas, a good proofread might have helped in this section. This chapter is very much of a summary, but the Southwest Wasteland Guide is available for those who require more detail. The book rounds off with a few appendices: a customizable character class (excellent detail on how to build a class here! ), details of fictional companies whose products are mentioned, some ‘jinx’ tables to make characters really unhappy, and even some Wasteland advertisements! Oh, and a character sheet. Overall, as post-apocalyptic ones go, this is a good one. It’s firmly rooted in background and location, and mechanically-sound… and well-supported with a series of adventures. If you like the action-adventure approach to survival, it’s recommended. It is Fallout with the serial numbers filed off, due to the confused status of some of the IP ownership with that. I believe that you are correct, Grim – although as I have no interest in computer games I’ve no first-hand experience! Yep, Bethesda/ Zenimax commissioned the TT RPG for Fallout, but when this was assembled and ready to print, they backed out and pulled the license. I contacted Zenimax last year about acquiring the license to do a Fallout RPG but they weren’t interested in attempting that route again. Crying shame too. It’s a setting that would be great for tabletop. I’m glad you reviewed this (and that it looks solid). There’s a couple more settings books and a whole raft of adventures – all available as PDF downloads – if you are interested in giving it a go on the tabletop. I’m sure if you know the computer game well you would be able to ‘tweak’ anything that needs changing to conform with it. Jeff, this was indeed going to be Fallout PnP published through Creeper Games. However it was licensed through Interplay, before the sale of the Fallout property to Bethesda. Bethesda filed a infringement claim against both Creeper and Interplay stating that neither party had the rights to make a contract for Fallout PnP game since they owned the rights to all thing Fallout from a license agreement before Creeper’s. Because of the legal fight between Creeper, Interplay, and Bethesda over the Fallout brand, you won’t see a Fallout PnP until the legal battle is over sometime in 2012. This information can be found on various websites and forums, as well as internet court documents if you are interested in learning more about. That is where I have gather this information. A copy of this with the Fallout 3 strategy guide for equipment stats (for those that play xbox/etc) and you could easily make a PnP game.